adidas Black History Month (BHM) Collection to be Realesed This May in The Philippines: Prices, Picture, and More Here! adidas and NBA's all-time leading scorer, Kareem Abdul-Jabbar pays tribute to Black History Month with a range of basketball shoes. 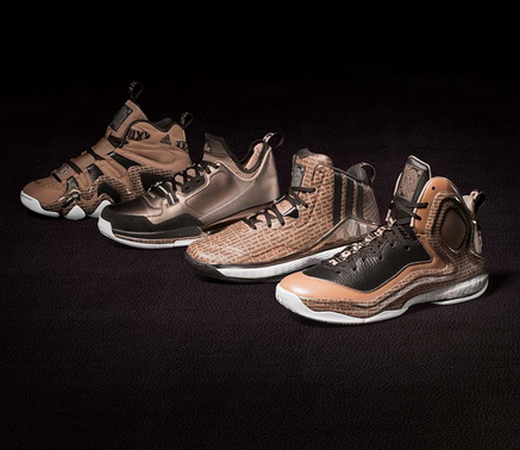 The Black History Month Collection features the Crazy 8, D Lillard 1, J Wall 1, and D Rose 5 Boost shoes that will drop in the Philippines this May 15, 2015 at 6pm. The collection will be available in very limited quantities in the NBA Store and adidas Trinoma only. adidas and Kareem Abdul-Jabbar unveiled a limited edition Black History Month Collection inspired by the NBA's all-time leading scorer and one of the game's most prominent philanthropists and ambassadors. Each basketball shoe model and specialty packaging features sepia tones, inspirational quotes and details that provide a vivid journey through the four most important eras of his legendary and record-breaking career. "I was very fortunate to have African-American role models and pioneers I could identify with and learn from as I forged my career in basketball and my personal journey in life," said Abdul-Jabbar. "Every success I've had is due to countless hours of hard work physically and mentally, and I'm proud to tell that story and inspire the next generation of role models as we celebrate the accomplishments of African-American leaders next month." A portion of the proceeds from the Black History Month Collection will be donated to Kareem's Sky Hook Foundation, which improves the lives of underprivileged youth. Crazy 8 – "Fundamentals are the Foundation for Excellence – '61 –'65"
The Crazy 8 features a canvas upper to pay homage to basketball shoes of the 1960s, while the upper's cracked texture and sockliner echo the blacktop courts of Harlem where Kareem first honed his game. The purple and gold sockliner colors represent Power Memorial Academy, where Kareem led his high school team to record-breaking success which included a 79-2 record and national championship. "Fundamentals are the Foundation for Excellence" is printed on the sockliner and upper to recognize Kareem's mantra during his high school career. J Wall 1 – "Rules are What Make the Game Challenging – '65 – '69"
The J Wall 1 shoe upper and sockliner features the words "Rules are What Make the Game Challenging" to represent Kareem's career at UCLA, during which the college game banned dunking because of his dominance. Kareem still persevered and owned the era, leading the Bruins to three national championships and an 88-2 record during his time on the team. The blue and gold sockliner features a hardwood print that pays homage to Pauley Pavilion, where Bruins' basketball has called home since 1965. D Rose 5 Boost – "The Hook Shot is Worth a Thousand Words – '69 – '75"
The D Rose 5 Boost upper and sockliner feature the words "The Hook Shot is Worth a Thousand Words" to represent the signature shot that defined his career. Drafted by the Milwaukee Bucks, Kareem's immediate impact and signature sky hook helped the Bucks win an NBA championship in 1971 and saw him earn the first three NBA Most Valuable Player awards of his career. D Lillard – "When the Music Changes, so Does the Dance – '75 – '89"
This shoe features this mantra on the upper and sockliner to represent the years that cemented Kareem's legacy as one of the NBA's greatest players and brought five NBA Championships to the "Showtime" Los Angeles Lakers. Kareem's consistent low post-scoring, rebounding and rim-protection helped LA become one of the most successful basketball dynasties of all-time. The purple and gold sockliner represents the classic Lakers colors while palm trees represent LA scenery. During this period of his career, Kareem began to practice yoga regularly, which he said drove his longevity and consistency in the league. The move to Hollywood also opened up additional opportunities for him, including a classic cameo in the movie "Airplane." The Crazy 8 (Php 6,495), J Wall 1 (Php 6,495), D Rose 5 Boost (Php 8,495) and D Lillard 1 (Php 5,995) will be available in very limited quantities in the Philippines on May 15, 2015 at 6pm in the NBA Store and adidas Trinoma only.